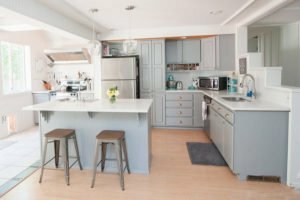 Taking a DIY approach to renovating your kitchen is a great way to save money and put your own stamp on your home’s interior design. A big area to save money on when completing your own kitchen makeover is the cabinets. 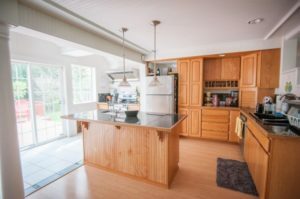 Replacing old cabinets with new ones can cost a hefty chunk of change, but you can give your old cabinets new life without ripping them out or spending hours sanding and stripping. It’s absolutely possible with a magical little invention called chalk paint. Chalk paint is the perfect choice for painting cabinets because it’s simple to use and requires minimal prep. No more renting a giant sander and spending hours trying to strip off the old finish or topcoat! Chalk paint’s formulation sticks to a wide range of surface types, and it does so without chipping or flaking. Many brands of chalk paint are available, from Country Chic to Annie Sloan to Rust-Oleum. A little goes a long way, so you can save money by purchasing less paint but still getting the same coverage. Chalk paint is easy to use — just follow these directions. Remove your cabinet doors and drawer fronts. Tape off the floor and around outlets, counter edges, and appliances with some FrogTape or ScotchBlue painter’s tape. Clean your cabinets of any dirt, grease, and grime by using warm, soapy water or a mild cleanser, like trisodium phosphate (TSP). Wipe dry with a microfiber cotton cloth. It isn’t really required, but I still like to sand my cabinets lightly with a 120-grit sanding block or piece of sandpaper. About 30 seconds a drawer or door is more than enough. If you do decide to sand, wipe the surface clean again with another microfiber cloth to remove all dust and debris. Using a paint roller or brush, coat your cabinets, drawers, and built-ins with one coat of primer. Let dry for about 30 minutes to an hour. Using a paint roller or brush, apply two coats of chalk paint. 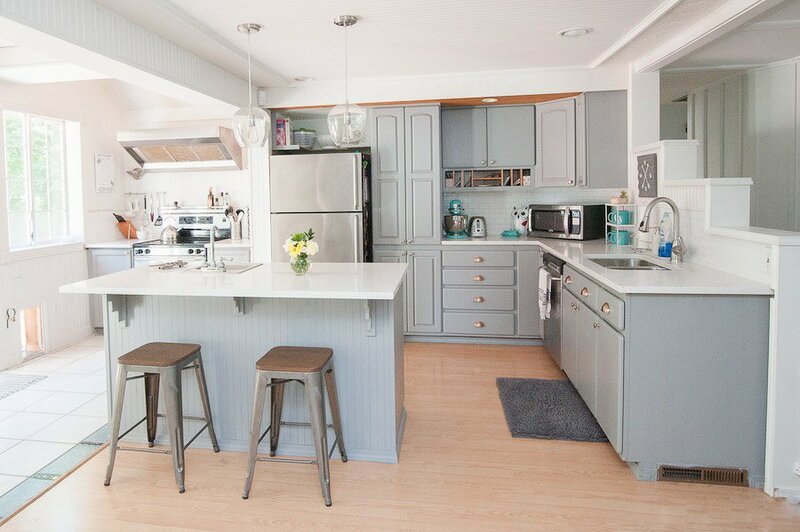 We used the color Pebble Beach from Country Chic, which is a nice, neutral cool gray. Allow a couple of hours dry time between coats, and let dry for 24 hours after the last coat. Once the chalk paint has had 24 hours to dry, use a foam brush and apply two coats of topcoat (or Tough Coat, if you’re using the Country Chic line), giving an hour of dry time between coats. The foam brush is to ensure there aren’t any streaks in the final finish. Let cure for 24 hours before moving or replacing cabinet doors so the finish has time to harden and avoid scratching. Reinstall cabinet doors and drawer fronts. If desired, install or change out hardware. Et voilà! A brand new kitchen for a fraction of the price. Painting cabinets may take a little bit of time and elbow grease, but the impact that freshly painted cabinets can make is staggering. And with the addition of clever time-saving products like chalk paint, you can have a whole new look by the end of the weekend with minimal prep or hassle. Tackle your kitchen cabinets and take control of the design of your home. You won’t regret it.